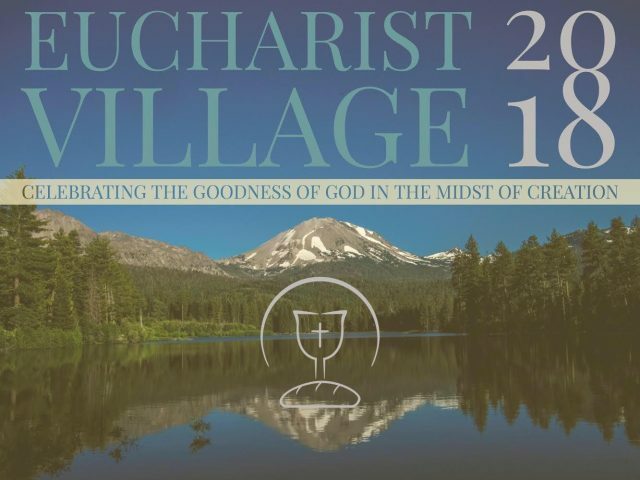 November 9-11 in the Santa Cruz Mountains! 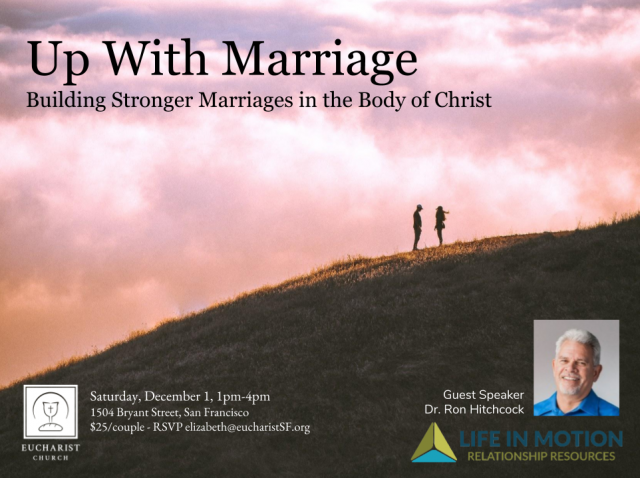 This will be a great time together. For more information, follow this link. Chinese Lunar New Years is the biggest holiday in Chinese Culture, and being away from home during this festival can be very difficult, especially for international students. So this year Eucharist Church hosted a Chinese New Years party at the Wu Family’s home. There was over 30 people in attendance, tons of special festive food and snacks, and several hundred traditional Chinese dumplings were made and wrapped from scratch. It was a blessing to be able to show the love of Christ through hospitality during this special time of year for these students. 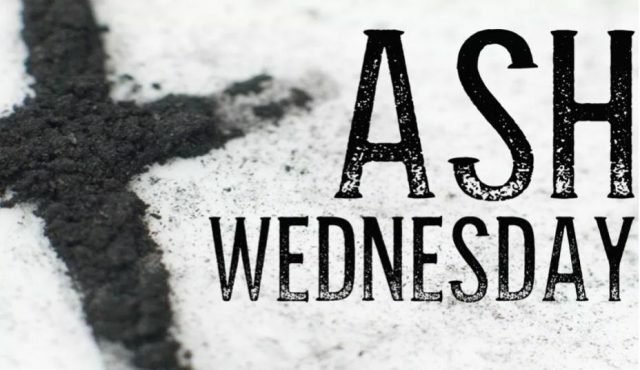 A special service launching the season of Lent in which we are reminded of our mortality and our total dependence on Christ. Wednesday, February 14, 7:00pm. 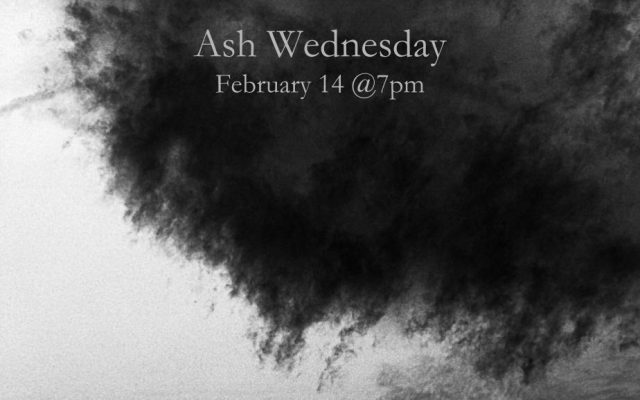 Feel free to come early (6:30) for priestly confession or silent contemplation. Childcare provided. In the spirit of St. Nicholas, we enjoyed a wonderful evening of food, drink, and an opportunity to give generously. 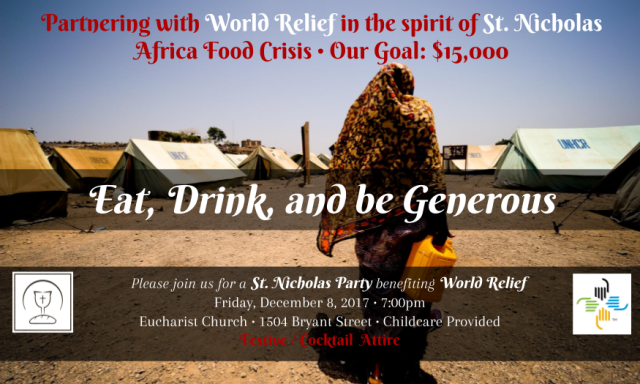 We partnered with World Relief (WR) in an effort to contribute $15,000 toward the Africa Food Crisis. Eucharist partnered with Bridges International to welcome new international students to America from Academy of Arts University with a night of food and games. Eucharist participated in the International Student Thanksgiving Exchange Program. In partnership with Bridges International, we paired international students with local Christian families so that they could experience this American Holiday. On Wednesday, October 4th several members of Eucharist hosted a Mid-Autumn Festival dinner for international students. Mid-Autumn Festival is a major Chinese holiday and a time when families get together for a special meal and time of fellowship. For many students this was their first Chinese festival away from home. It was really special to be able to give international students a taste of home. On Saturday August 23rd Eucharist Church partnered with Bridges International and other ministries and churches in the Bay Area to celebrate International Student Day at Chrissy Fields. Over 200 International Students showed up for a wonderful day filled with food, games, tours, and new friends. 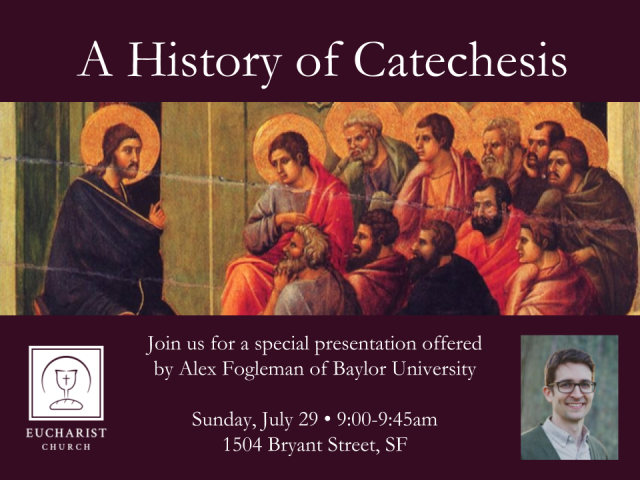 On Wednesday, September 6 we gathered together at Fr. Joshua & Alicia’s home for an evening of singing, praying, fellowship, and seeking the Lord. It was a wonderful time of being the Body of Christ together and interceding for each other, our city, and our world. On Thursday, August 22nd the Wu Family, along several members of Eucharist, hosted a pizza party for new international students at their home. For some of the students this was their first time in an American’s home! It was a wonderful time of practicing hospitality and sharing the love of Jesus with students. On Thursday, August 17th we partnered with Bridges International (CRU) in welcoming International students to America with a backyard barbecue. It was a great time of connecting with students and being a welcoming presence. Many new friendships were made. July 26-30, 2017 (Wednesday evening-Sunday afternoon). This was a unique opportunity to bond together in a shared communal rhythm of feasting (camp style), prayer, holy leisure (hiking, swimming, campfire, games, etc.) over a four day period. We camped together at Giant Gap Campground (Sugar Pine Reservoir) in the Sierra Nevada mountains off of highway 80. More information about this can be found here. After worship, July 9 we enjoyed a newcomers luncheon. It included a Q&A about Eucharist Church, and opportunity to learn more about our congregation’s mission / vision. Tuesday evening, July 18 was a fun evening of fellowship at the ball park. The Giants defeated the Indians! We had a block of seats together and thoroughly enjoyed ourselves. Saturday, June 3 at 2pm @ St. Timothy’s Lutheran Church – 5100 Camden Ave, San Jose, CA 95124. Bishop Todd Hunter (C4SO) was present to celebrate this occasion: 7 people from Eucharist being confirmed! Following the service there was a cake reception. Curious about confirmation, check out our baptism | confirmation info sheet. Saturday, April 29 we enjoyed the beauty of the outdoors together, walking along the gorgeous coast of SF (Lands End / W. Fort Miley) and relaxing together over a picnic lunch and games. We had an epic week in which we intentionally entered into the drama of the last week of Jesus’ life. We had FIVE gatherings the week of April 9-16. For more info about what we did, check out the Holy Week info page. Point Bonita YMCA conference center in Marin Headlands (pictured left). We enjoyed a special lenten silent retreat led by Christian spiritual director Danny Bridgens. We enjoyed a tasty breakfast for dinner menu together in one last hurrah before we entered into the fasting of Lent. The Christian journey is one of oscillating between feasting and fasting. 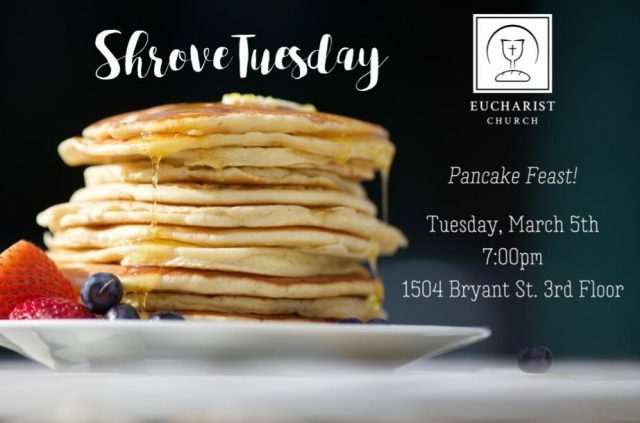 Shrove Tuesday is traditionally a day of feasting before the 40 day period of fasting leading up to Easter. We enjoyed delicious food (Indian-themed… inspired by the magi who traveled from the East), drinks, a game or two and a really good time reconnecting after the Christmas holiday travels. On Thursday, December 1st we came together to make Advent Wreaths and pray evening prayer together. We provided the necessary elements for making an Advent Wreath. It was a lot of fun and included good singing. On Sunday, October 30 following worship we set up a sack lunch making station and then shared lunches and toiletries with our neighbors. Have you looked at a sample ballot this election cycle? There are 42 propositions / measures to vote on in addition to all of the candidates. Most people overwhelmed… who has the time to research all of this? Our answer: crowdsource research on the issues so that we can be informed voters. 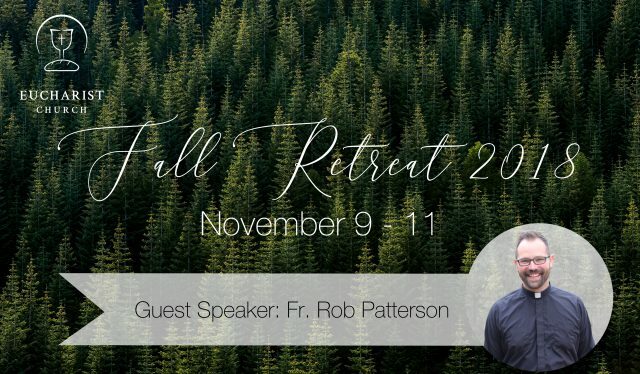 A weekend of renewal, relational connectedness, spiritual formation, recreation and more! It was an awesome weekend!!! On October 22nd at 5pm we celebrated the ordination to the priesthood of Rev. Joshua Wu and Rev. Kyle Logan. Bishop Eric Menees presided on behalf of Bishop Todd Hunter. 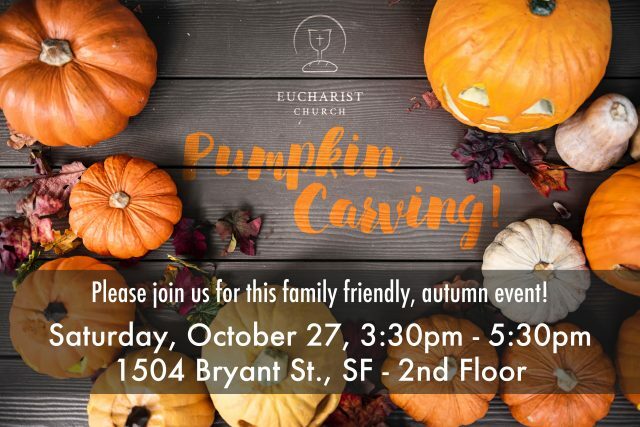 Saturday, October 8, 11:00am-1:00pm, at Elizabeth Kuriakose’s place. The women of Eucharist Church enjoyed a casual time of food and fellowship. A Community Event featuring a demonstration of the famous Chinese Tea ceremony alongside a tea tasting with appetizers. 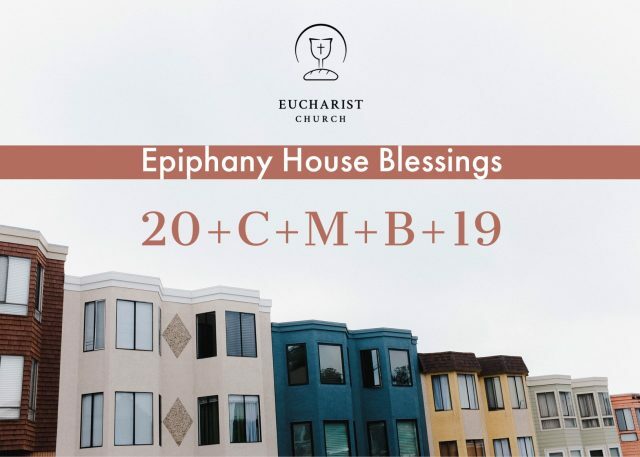 Christians have historically been known for their hospitality; it is one of our major values at Eucharist Church. This event was an opportunity to welcome others as we enjoy the delights of tea together. 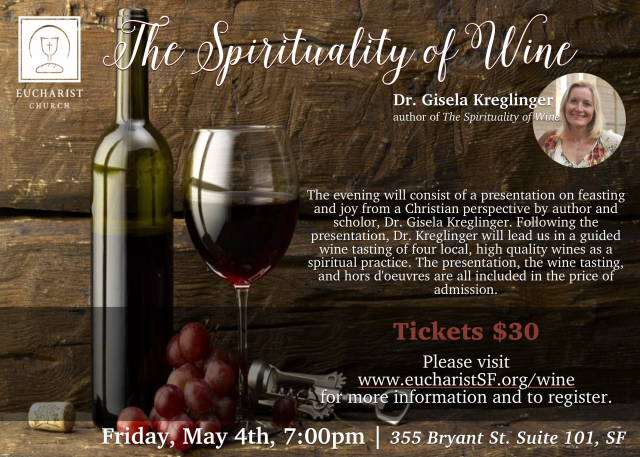 In response to the lecture of Dr. Gisela Kreglinger at the “Spirituality of Wine” event, we hosted a special screening of this classic, grace-filled film. We enjoyed wine, appetizers and good conversation in addition to the film. 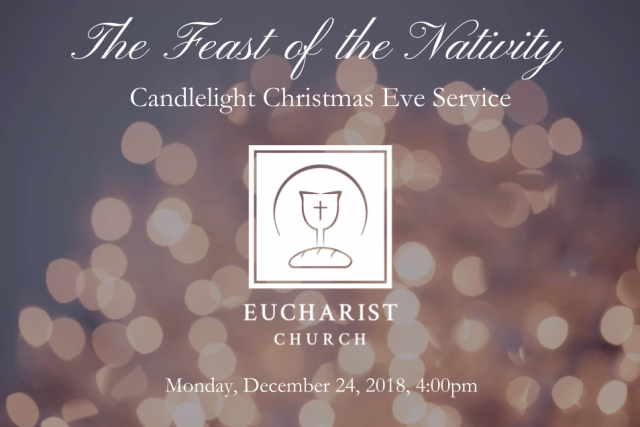 Christianity has a rich history of feasting and joy in connection with wine. This can readily be seen in Jesus’ first miracle at the wedding in Cana (John 2), turing water into wine. But the connections to Christian spirituality run much deeper (beginning in Judaism). 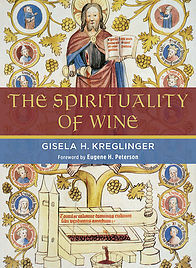 Dr. Gisela Kreglinger is uniquely gifted in her ability to weave together the worlds of the Bible, spirituality and history, all while putting them in conversation with the modern craft of winemaking. She has a PhD from University of St. Andrews in Scotland in Christian spirituality and grew up on a family winery in Germany. She gave us a special talk about the joy of wine and feasting (the topic of her most recent book), answered questions and led us in a sampling of some wines sourced in local vineyards. We celebrated Maundy Thursday, Good Friday and Easter this year. We learned from World Relief about how we can offer Christian hospitality to people who have endured unspeakable tragedy and who are looking for a new home and a new life. We raised money to help 3+ families transition to a new life here in the US. From October 10-November 22, a group of 13 people went through a 40-day experience of orienting daily life around God. It was a highly impacting experience.